Prescribed Fire Update – 4/1/1 – 9:00 pm – Today firefighters treated 140 acres on the Perk Project with prescribed fire, bringing the total number of acres treated (to date) to 1,908. With Red Flag warnings (high winds) in the forecast beginning tomorrow (4/2) and possibly through the week, no additional ignition operations are planned for the week of April 2nd. Firefighters will continue to patrol and monitor the area throughout the week. Perk project is 2,107-2,500 acres, broadcast burn, located 5 miles southwest of Weed, NM. be on site to assess the treatment area, using prescribed fire to treat pockets of unburned fuel within the unit boundary and along the outer edges of the project boundary; and patrolling and monitoring the area that has been treated over the past days. Many factors have contributed to the success of using prescribed fire to treat the fuels on the Perk Project over the past week. The combination of available staff and personnel to commit to the project; favorable weather and fuel conditions; community and public support; and light winds that helped with smoke dispersal (which also helped minimize smoke impacts). Prescribed Fire Update – 3/31/1 – 9:30 am – Firefighters treated an additional 200 acres on the Perk Project yesterday (3/30). They are resuming ignitions operations once again today in the Little Lewis Canyon area, under very favorable weather and fuel conditions. Smoke may be visible from Weed, Cloudcroft, Ruidoso, Mescalero, Hope, Duncan, Roswell and Pinon, NM (and surrounding areas). Prescribed Fire Update 3/30/18 – 11:45 am – Ignition operations continue again today. 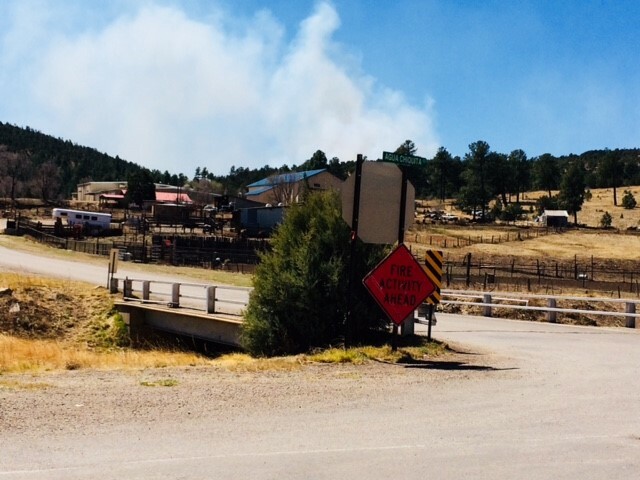 All conditions are favorable for firefighters to treat additional acreage on the Perk Project today and possibly tomorrow, if conditions remain favorable. Smoke will be visible from Weed, Cloudcroft, Ruidoso, Mescalero, Hope, Duncan, Roswell and Pinon, NM. through broadcast burning, where fire is applied generally to most or all of an area within well defined boundaries for reduction of fuel hazard, as a resource management treatment, or both. Today’s activities resulted in a “mosaic” burn – as the fire moved across the land (within the 500-acre unit that was treated today), the fire burned at different intensities, leaving patches of ground and fuels that were affected differently. Some areas are visibly affected by the applied fire, while in other areas, it is barely noticeable that fire was present. This is a desired effect that firefighters strategically attain by applying fire in a pattern-like formation at a given tempo. The patterns and tempos can always be adjusted to achieve the fire effects that will help meet the project’s objectives. Prescribed Fire Update – 3/29/18 – 2:30 pm – Ignitions are underway on the Perk Project and operations are going well. About 50 firefighters are assigned to the project today. The smoke is visible from Weed — and it seems to be lifting and drifting away from Weed. Ignitions will likely continue until 4:00 pm today. Prescribed Fire Update – 3/28/18 – 9:00 pm – Today’s conditions were more favorable, resulting in an additional 50 acres treated with prescribed fire on the Perk project. The weather is trending towards warmer temperatures over the next few days which will continue to provide improved conditions for burning. 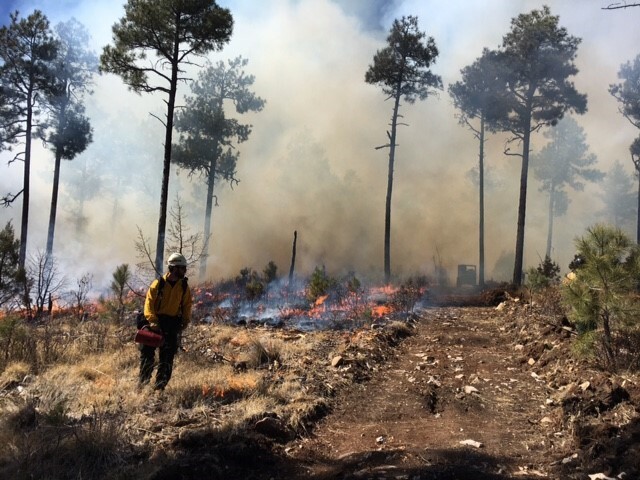 Prescribed Fire Update – 3/28/18 – 1:00 pm – Ignitions are underway on the Perk Prescribed Fire project located 5 miles southwest of Weed, NM. Smoke may be visible during ignitions. Prescribed Fire Update – 3/27/18 – 3:00 pm – Firefighters have ceased ignitions for today on the Perk Prescribed Fire project. Some of the fuels had retained too much moisture from recent precipitation in the general vicinity. Firefighters opted to cease ignitions around 2:00 pm today and will attempt to resume ignition operations again tomorrow (3/28) if conditions are favorable. They were able to treat 15 acres with prescribed fire today. Prescribed Fire Update – 3/27/18 – 1:00 pm – Ignitions are underway on the Perk Prescribed Fire project. Smoke will be visible during ignitions. Light winds will help with smoke dispersal. Prescribed Fire Update – 3/26/18 – 7:00 pm – Firefighters are tentatively planning to resume ignition operations on the Perk Prescribed Fire project, located 5 miles SW of Weed, on Tuesday, March 27, if fuel and weather conditions remain favorable. An update will be posted on this site on March 27th to provide a status update on the project (whether or not ignitions are underway). Prescribed Fire Update – 3/7/18 – 4:00 pm – Ignition operations are temporarily “on-hold” on the Perk Prescribed Fire project, located 5 miles SW of Weed. The decision to halt ignitions was made yesterday (3/6/18) as a result of a high probability of poor ventilation on that day and for several days into the remainder of the week. Under poor ventilation conditions smoke has a greater potential of impacting communities. Firefighters will continue patrols in the project area and to monitor fuel and weather conditions over the next few weeks. They are targeting the end of March to resume ignition operations IF CONDITIONS ARE FAVORABLE. Prescribed Fire Update – 3/3/18 – 6:15 pm – Firefighters were able to treat an additional 200 acres today on the Perk Prescribed Fire project. 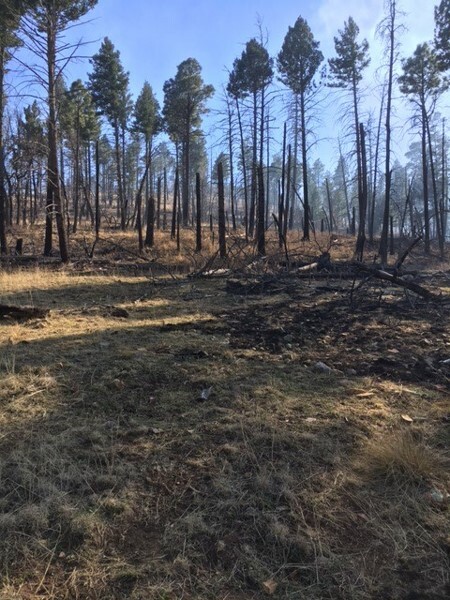 Prescribed Fire Update – 3/3/18 – 11:00 am – Firefighters are taking advantage of favorable weather and burning conditions today as they resume ignitions on the Perk Prescribed Fire project located about 5 miles southwest of Weed. Smoke may be visible during ignitions. Prescribed fire operations on Perk project. Prescribed Fire project. If conditions remain favorable through the weekend, they may continue with ignitions. The area that was treated today will continue to be monitored and patrolled over the next few days. Prescribed Fire Update – 3/2/18 – 1:00 pm – Ignitions are underway on the Perk Prescribed Fire project. Smoke may be visible during Ignitions. Prescribed Fire Update 3/1/18 – 5:30 pm – Firefighters successfully treated 100 acres with prescribed fire today on the Perk Prescribed Fire project. The area will be monitored and patrolled over the next few days. Prescribed Fire Update 3/1/18 – 12:30 pm – Ignitions are underway on the Perk Prescribed Fire project located 5 miles SW of Weed. Smoke may be visible during ignitions. Prescribed Fire Update 11/14/17 – 6:00 PM – Firefighters treated the remaining Wet Burnt prescribed fire unit today, bringing the total number of acres treated to 290 (60 ac treated yesterday and 230 treated today). They will return to the site tomorrow (11/15) to patrol, monitor and tend to any unburned pockets of fuel. At this time, there are no plans to move forward with ignitions on any of the prescribed fire projects (see list below) on the SACRAMENTO Ranger District until after the first of the year (2018). Prescribed Fire Update 11/14/17 – 11:30 AM – Ignitions are underway on the Wet Burnt Prescribed Fire project located 5 miles north of Mayhill. Lincoln National Forest firefighters along with BLM, BIA, Mescalero and local VFD firefighters make up the 30 (personnel) resources that are currently assigned to this project. The mobilization and commitment of resources along with the current favorable weather conditions have set up a unique window of opportunity to complete ignitions on the Wet Burnt project this week. Smoke may be visible from Mayhill and the surrounding area during ignitions. Easterly winds are forecasted for this afternoon and into tonight which will probably push smoke towards 16 Springs Subdivision and Cloudcroft. The winds are forecasted to taper off tomorrow afternoon and shift back to light westerly winds which will help mitigate any smoke impacts to populated areas. Generally, smoke is known to settle into drainages at night. Smoke impacts are expected to be minimal and of short duration — today through tomorrow evening. Prescribed Fire Update 11/13/17 – 6:30 PM – Firefighters successfully treated 60 acres today on the Wet Burnt project. They plan to continue with ignitions tomorrow (11/14) if weather conditions remain favorable. Prescribed Fire Update 11/13/17 -12:00 PM – Ignitions are underway on the Wet Burnt prescribed fire project located 5 miles north of Mayhill. Smoke may be visible from Mayhill and the surrounding area during ignitions. ALAMOGORDO, CLOUDCROFT, NM – September 23, 2017 – Fire officials on the Lincoln National Forest’s Sacramento Ranger District are planning to resume prescribed fire operations on projects within the boundaries of the Sacramento Ranger District. Ignitions will take place during optimum weather conditions, beginning in October 2017 and continuing through April 2018, as weather conditions permit. Perk 2,107 acres: broadcast burn located 5 miles southwest of Weed, NM. Carissa, 243 acres: piled slash, this unit is located 11 miles southwest of Weed, NM and ½ mile northeast of the Carissa Lookout Tower. Creek, 88 acres: piled slash, this unit is located 11 miles southwest of Weed, NM and one mile east of the Carissa Lookout. Black Bear, 516 acres: piled slash, located ½ mile south of Cloudcroft, NM. Ignitions are dependent upon weather conditions on the day of the burn and during the burning period(s). Fire managers monitor conditions closely to ensure that they are within the ranges that have been identified in the Burn Plan. Successful prescribed burning results in good smoke dispersal and desired fire effects. These prescribed fire projects will reduce fuel loads, which can help minimize potential wildfire risks and impacts to the area. Public and firefighter safety are always primary objectives during fire-related activities and missions. During ignition operations, smoke may be visible from communities that are in proximity of the prescribed fire projects. Smoke may settle into drainages and lower elevations at night, but is expected to dissipate by late-morning, as daytime temperatures increase. In the event that smoke is encountered on travel ways, motorists are advised to reduce travel speeds and turn lights on.